In general – do you think that the activities undertaken by recruiters on LinkedIn have any negative repercussions on the LinkedIn experience for non-recruiters? If so, why, and how? This is the first in a 3 part series examining the opportunities recruiters have to raise the level of their game and give recruiters a better name in the hearts and minds of the people who matter most in recruiting – the talent they are looking to recruit. I’m going to give you some of my observations and thoughts on the matter of whether or not recruiters “ruin” LinkedIn, but the main motivator behind me writing this post is to get you thinking, hear from you and get your perspective, and ask for your help in making LinkedIn a better place for everyone. How Many Recruiters are on LinkedIn? This is hard to nail down precisely, but by some searches and calculations, I’d estimate it’s around 1% or less globally. For example, if you search LinkedIn for people with one of these terms in their current title: (recruiter OR recruiting OR recruitment OR sourcer OR sourcing OR talent OR “executive search” OR staffing), you’ll get a little more than 611,000 results globally. For those who are interested, out of curiosity I did search for recruiting related titles in Spanish, French, and Chinese (e.g. 招聘), but that didn’t add much to the results. 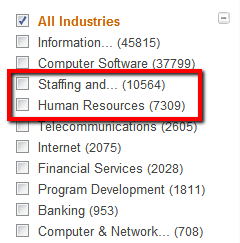 You get a big boost when you add HR OR “human resources” to the search above, netting you around 1,600,000 results. Of course, it’s hard to say how many HR folks are on LinkedIn and actually sourcing, recruiting, or at least posting jobs in groups and such, but it’s interesting to see the total number of sourcing, recruiting, and HR folks on LinkedIn nonetheless. If you go with LinkedIn’s latest published figure of 160,000,000 users, and even if you include HR folks in the search for recruiting professionals, they only account for about 1% of the total user population of LinkedIn. 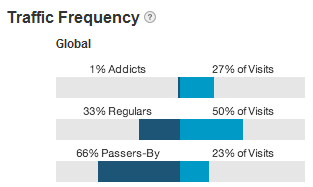 So how could 1% or less of the total user base of LinkedIn possibly have a negative impact on the other 99%? I see two primary areas, if any exist. Have you ever noticed that sometimes it seems there are more recruiters in non-recruiting groups than the people that “should” be in the group? Now, any good sourcer or recruiter follows the golden rule of “go where your talent lives online,” so we can’t fault people for doing what they are supposed to do. However, the mere presence of recruiting professionals in groups, even at high percentages of the total group population, doesn’t have any negative impact upon the non-recruiting group members. It’s their behavior and activity, or lack thereof in some cases. 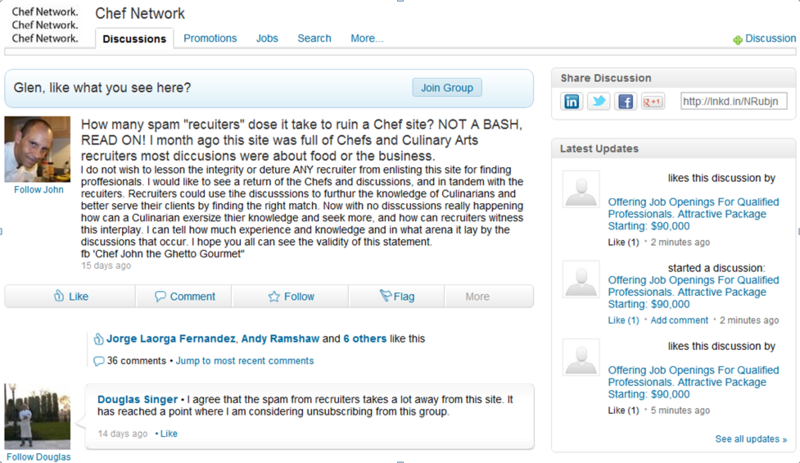 A quick Google search pulled something interesting up from the “Chef Network” group on LinkedIn. Overlooking the spelling errors (hey – it’s authentic, right? ), check out the the discussion and the “latest updates” section. I blanked out the recruiter who posted all 3 of the latest updates, which actually consisted of a job posting in the discussion area and 2 “likes” for their own job posting, all in a 3 minute span. I see many recruiters “like” their own jobs – is it just me, or isn’t this lame for obvious reasons? Now, the majority of my experience in sourcing and recruiting has been information technology, finance and accounting, health information management and clinical research – I’ve never had to source and recruit chefs before. I’m inclined to say that if recruiter spam has penetrated down to chef groups, it doesn’t bode well. We have reached a sad and unacceptable state in recruiting when our behavior makes people think about leaving a group, and in some cases leaving LinkedIn altogether. If only the recruiters posting jobs would simply post jobs in the jobs section and not flood the discussions with job posts, recruiters would be more welcome and more warmly received when they do comment. However, if you run this Google search for [group spam recruiters linkedin], you can see that recruiters simply aren’t following the rules and respecting group moderators and members. 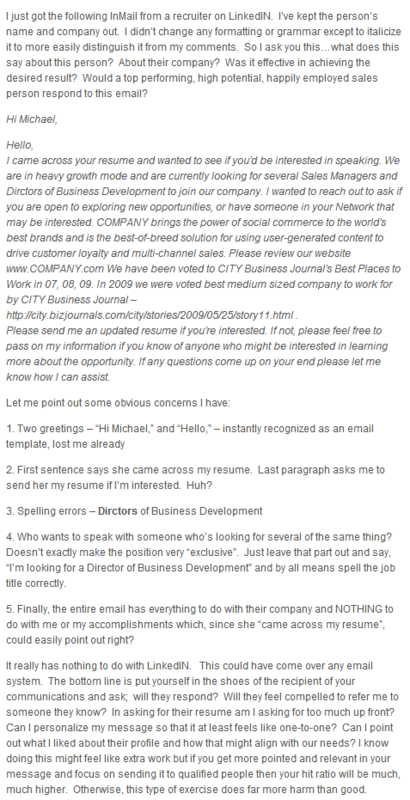 As you can see from this next group post, some folks welcome job postings – just as long as they are in the right place! The sad thing is in many cases, I’d be willing to bet that the offending recruiters aren’t being malicious or even consciously neglectful – just completely thoughtless. Mindless might be more accurate. What good do recruiters think they are accomplishing by posting jobs in the discussion section of groups? I’m sure they don’t get a high rate of response, or any response in most cases – so why do they do it? I have my thoughts – I’d like to know yours. I can almost guarantee you that some of these serial offenders don’t even read the group content (embarrassing! ), or at least I hope they don’t. Because if they read the complaints from the group members and continued to post jobs in the discussion area then they don’t have an excuse when they continue to ignore the negative responses and reminders about the group rules! 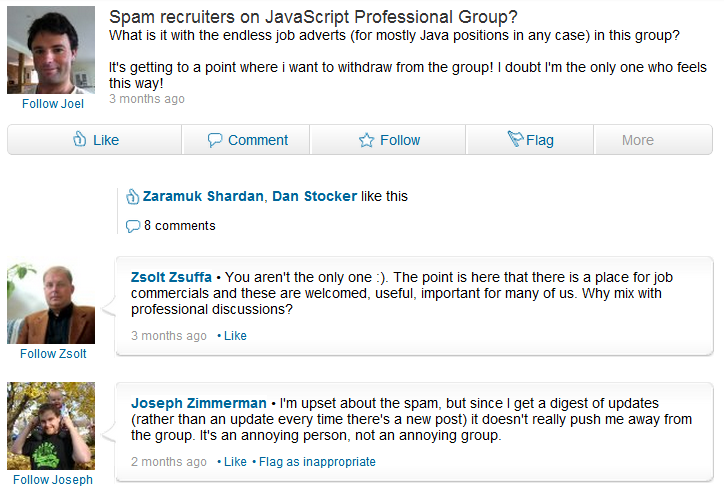 For as long as I can remember, there have been some groups that simply won’t even allow recruiters into them. What’s sad about this is that the group moderators and members likely don’t actually have a problem with recruiters joining their group – if they could be assured that the recruiters would behave properly and respectfully. The real issue here is how some recruiters behave – not obeying group guidelines and rules, and being thoughtless and inconsiderate. Why do you think chefs join a chef network group on LinkedIn? The same reason why Java developers join Java groups on LinkedIn – to network and discuss their area of interest with people who share similar interests – not to be preyed upon by recruiters. 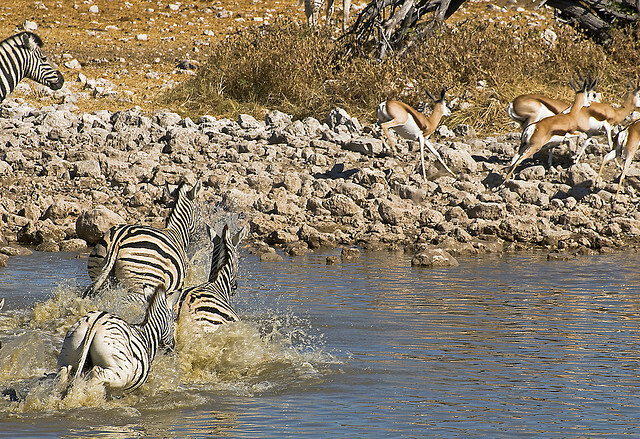 Let’s face it – crocodiles and lions don’t ruin water holes because they happen to be in and near them, they “ruin” water holes for zebras, antelopes and other animals coming to get a drink because they get attacked. The second major way in which recruiters can detract from the average non-recruiting LinkedIn user comes in the form of messaging, both paid InMails and free group messages. It’s surprising to me to continue to find so many recruiters who don’t put much thought into their messaging, especially how their messages and content will be received by the recipients. Sending bland and boring messages seems to be all together too common. Have you ever been on the receiving end of a bad, or at the very least, an uninspiring InMail? I’ve actually had candidates send me some of the InMails they’ve received, unsolicited. Very interesting indeed. 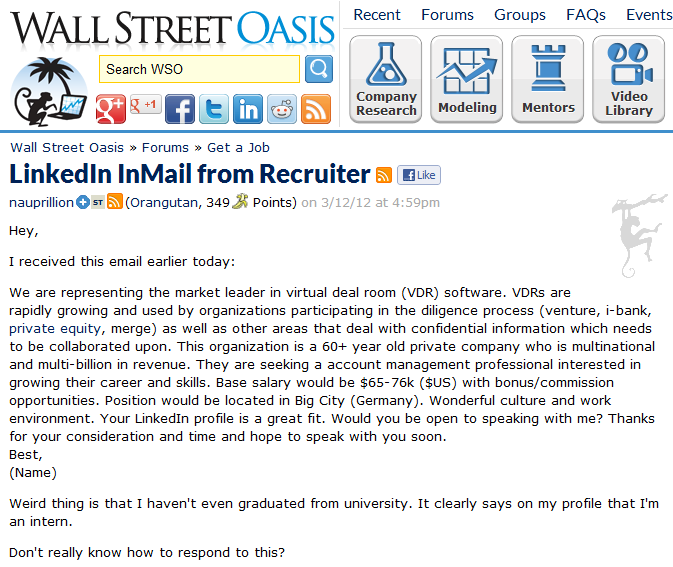 A quick Google search for [recruiters horrible InMails] will give you some insight into how some InMails are perceived. News flash: If the person receiving your InMail is confused as to why they’re getting it and how to respond to it, you haven’t done a very good job in your messaging. And did you ever think that your InMails might end up as a Google search result? In fact, I’d argue it would be a good idea to assume that any InMail (or email, for that matter) could show up on the Internet. It might make you think twice about what you put in your InMail. Non-customized form/template InMails are just as bad as form/template emails. It’s pretty easy to identify the fact that someone didn’t take any time to actually read a person’s LinkedIn profile, and that they’re getting the same InMail that 5 or 50 other people are getting. These are received about as well as the junk mail you get in your mailbox. When recruiters send messages like the two examples above, they are contributing to a negative experience with recruiters on LinkedIn. It should be embarrassing when recruitees feel like they need to give guidance to recruiters on how to do a better job. That’s like going to Nordstrom and having such a bad experience with the salesperson assisting you that you feel compelled to offer them advice on how to be a better salesperson. Getting one of these InMails might be mildly annoying, but imagine if you got a couple of these a day. What kind of perception would you have about recruiters? Would you enjoy this byproduct of being on LinkedIn? Do you even know how many messages the people you reach out to daily get every day? I encourage you to ask a number of the prospects and candidates you speak with this week about the number of InMails, emails, and phone calls they get every week, and then ask them what they think about the quality of the messaging that gets sent their way. You might be unpleasantly surprised. It is important to note, however, that the average person isn’t bothered by getting InMails from recruiters, provided they are well crafted and make sense – this will be the subject of the second part in this blog series. Do I think recruiters ruin LinkedIn? However, I do think that thoughtless and careless recruiters definitely detract from the LinkedIn experience for many people through job spamming, blatantly disregarding group rules/policies, and sending embarrassingly poor messages to people. I also think that collectively the recruiting community can, at the very least, police other recruiters’ behavior in groups. 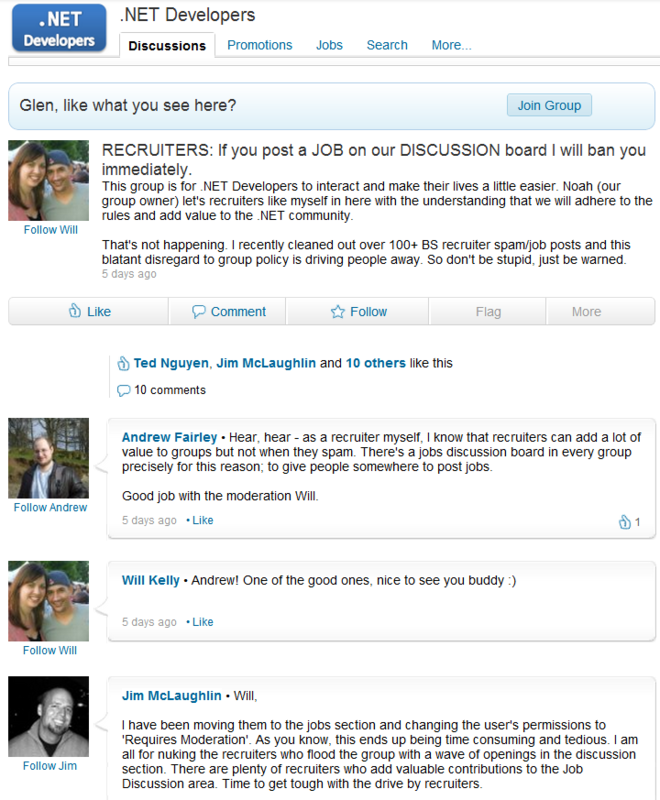 If you see job postings in the discussion section of a group, do your part and flag them as jobs just as Will has been doing in the .Net Developers group example that I featured above (good on you Will!). I think if you’re one of the recruiters who continues to post jobs in the discussion section of groups, you should stop it ASAP– you’re ruining a good thing for the rest of us. Lastly, I think recruiting managers need to take responsibility for their recruiters and inspect the InMails their recruiters are sending to candidates to identify training opportunities and to work to ensure the messaging of their teams is relevant and high quality.